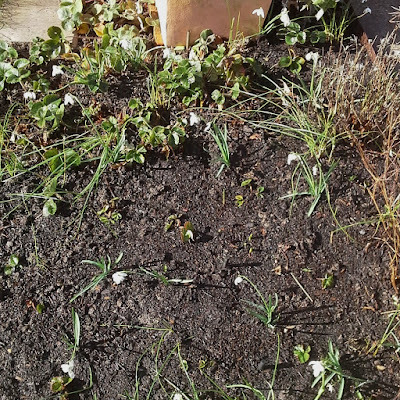 Last October I blogged about facing the fact that I couldn't continue to garden like I was a normal healthy person. At the time my ME was getting worse, and I had to rethink how I garden. Part of the plan was to get in paid help, which I did. In January this year I also did a skill swap with my friend J-P. In return for me doing a permaculture design for his new garden (a different kind of energy use from gardening), he would come and help me out in my garden. This has been incredibly helpful, and I'm now coming into a new growing season and ready the implement the other idea I mentioned, Spoonie Veg. What in the halls of horticulture is Spoonie Veg, I hear you cry?! First I better explain 'Spoons' from which Spoonie Veg derives. Spoonie comes from Spoon Theory, first described by Christine Miserandino. Her website But you don't look sick explains it fully (I highly recommend it), but for a simple introduction, Suzy Coulson's How will I use my spoons today poster (right) should give you the general idea. Spoons are a measurement unit of energy. That's 10 spoons already, before I've dealt with other activities like appointments, household activities (from general housework to paying bills etc), seeing friends, etc. And any kind of gardening activity will use up at least 5 spoons. For those who want to know, sadly I don't have enough spoons to have a job. For me at this point in my illness that would need like 30 spoons on it's own, at least, so you can see the problem there. Of course, you don't have say 15 spoons every day. I wish! Like many chronic illnesses, ME is a fluctuating illness. That means it can change day-to-day, hour-to-hour. I can wake up one day and think I might have 10 spoons approx for that day, then part-way through the day, crash and have to return to bed, having only used up 4 spoons. Those remaining 6 spoons don't get carried over. They are lost (actually, they never existed). It might mean cancelling a planned catch-up with friends, gardening tasks, or even a shower. Fluctuating illnesses are a daily/hourly negotiation and energy (spoons) is never guaranteed. Hopefully this has given you some idea about spoons/energy. Now on to Spoonie Veg*. Around the period I mentioned above, my friend Ingi and I had been discussing on Twitter what veg, fruit and herbs we could grow that didn't require too much energy from us as people with chronic illnesses and health/mobility issues. This is us, and people like us, who cannot spend as much time and energy (spoons) tending and harvesting our crops as those who are healthy. From a permaculture perspective you would look applying the 'low input, maximum output' model, but within the context of growing food when you have a chronic illness. We came up with the idea of Spoonie Veg, and I think an example will best help to explore the idea. Strawberries don't need anywhere near the amount of attention that tomatoes do. 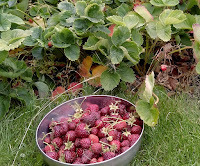 For strawberries, you use up spoons for planting, occasional watering and feeding, then harvesting and preparing/eating, Plus extra spoons if you want to take runners for future plants. Tomatoes, whether you sow from seed yourself or buy plug plants, they need potting on, planting out, watching for late frosts, regular feeding, constant watering, worrying about and looking out for blight, pinching out, tying in, checking you haven't over/under watered/fed, checking for pests, and then if the summer has been half-way decent to mean you are lucky enough to actually get fruit, harvesting and preparing/cooking. Lots more spoons. waiting to pick the plump red fruit. Ingi and I thought of applying a number between 1 and 5 to each fruit or veg to indicate how spoonie intensive each item was to grow. 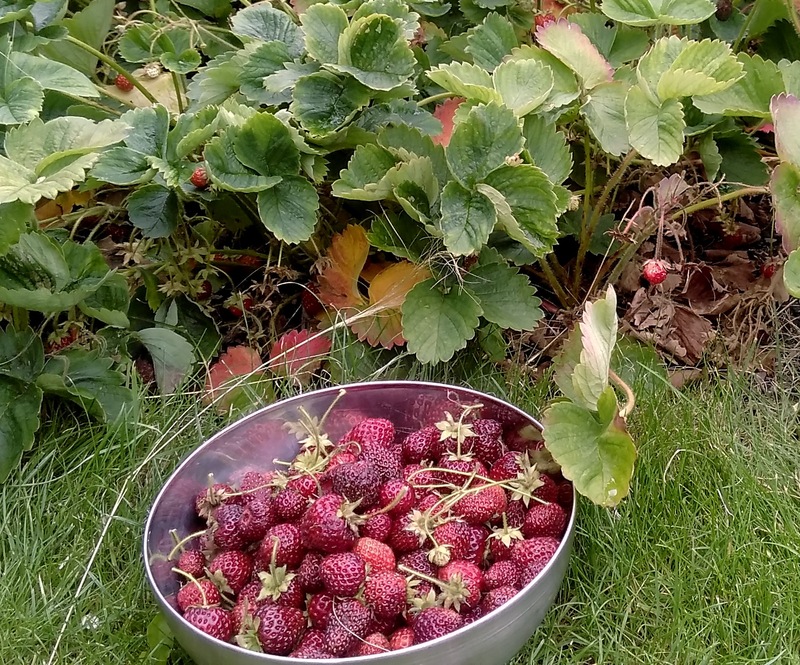 We both thought Strawberries were fairly easy and didn't need a lot of our time and energy in order to gain a harvest, so we gave them a Spoonie Veg rating of 1. Tomatoes however, require lots of energy and time on a very regular basis, for months, and at times they will need tending on a daily basis. So these we gave a Spoonie Veg rating of 5. Another example might be the difference between dwarf and climbing French Beans. They are both beans right, how different can they be? Both start out the same, sow seeds in modules, plant out. 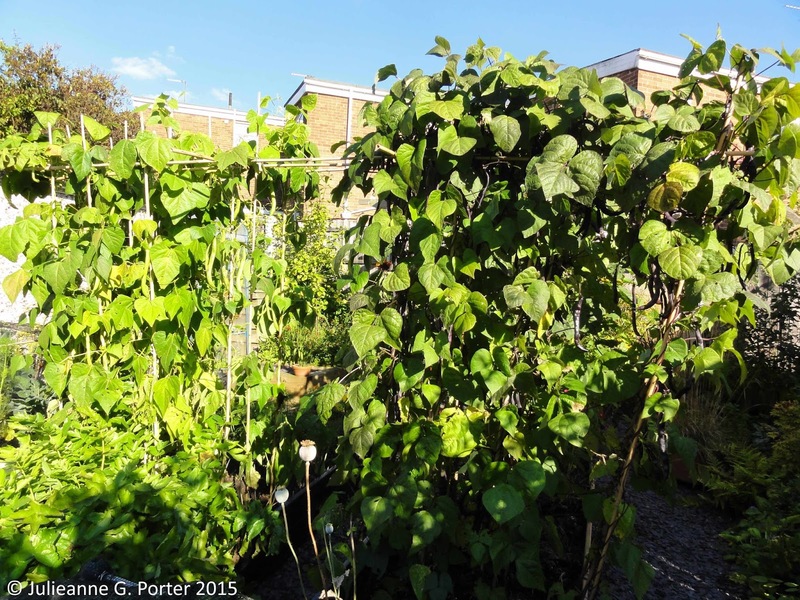 But climbing beans require the put up climbing canes/frames. Suddenly that takes energy use up a level, because not only do you have to put up (then take down) the canes, but you also have to check regularly that the beans are in fact climbing up the canes and not along the ground or into other veg. Last year I had to stop some climbing French Beans from twining around my parsnips! Anyway, this means Dwarf French Beans take 1-2 spoons, but Climbing Beans take 3 spoons. Another factor, you have to grow what you want to eat. No point deciding to grow Lettuce and Strawberries if you don't like them, even though they require less spoons than Climbing French or Runner Beans. In my case, I adore, simply LOVE Broad Beans, a veg that isn't easy to buy fresh. If I have to decide between putting my limited energy into either Climbing French Beans or Broad Beans, I'll go for Broad Beans. So it's all a balancing act between what you want to eat, how many spoons you have, and how difficult or not a particular crop is to grow. Herbs (annual), including: Coriander and Basil. Of course, how energy intensive a fruit or veg might be to grow can be highly subjective. It can depend on everything from how much you already know or don't know about growing in the first place, to how mild, moderate or severe your chronic illness. Furthermore, the rating I have given for each item above might be quite different to what another spoonie gives to the same vegetable etc. So where I give Dwarf Beans a 1-2 rating and Climbing Beans a 3 rating, Ingi would swap them around. For Ingi, harvesting Climbing Beans is easier on her back, and she finds them more forgiving of occasional neglect than Dwarf Beans, which are highly susceptible to slugs in her garden. For some reason this is less of a problem in my garden, possibly my 45cm high raised beds. So the numbering system is from my perspective and is for guidance. It's not an exact science. 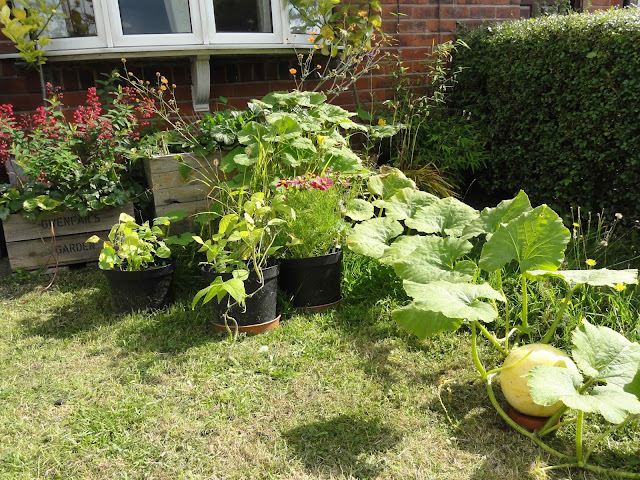 Finally, although the focus of Spoonie Veg idea is to show others with chronic illnesses the growing possibilities, this could also be of use to people new to gardening and who are embarking on their first attempts to grow their own. Over the coming months I'll be blogging about some of the individual fruit, veg and herbs listed above, going into detail to explain why I've assigned that specific number to each. It would be excellent to hear about your experiences, it doesn't matter whether you are a spoonie or not. What fruit, vegetables or herbs should be added, with what Spoonie Veg rating, and why? And if you are on Twitter, use the #SpoonieVeg hashtag. That's a great idea, I used an informal sort of version of it that included a sense of how much you got out compared to what you had to put in. So carrots lose because you only get one carrot per seed, and you have to deal with carrot root fly. Beans, on the other hand, in fact all legumes, are wonderfully rewarding and very easy to grow, you get loads per seed, and they even lock nitrogen into the soil. On the climbing bean front, I find they are more productive than the dwarf kind, and easier to pick (no bending over). The key for me was to install permanent climbing frames in my veg beds, which will also allow me to grow small squash plants vertically, and I am trying some trailing strawberries too. I'd also say that raspberries are one of the easiest and most rewarding soft fruits, along side rhubarb. Unlike strwaberries they can cope with a few weeds, and don't need ongoing maintenance (dealing with runners) other than the once per year cutting back. Thanks for your comment Janet. Last year my carrots got attacked by carrot root fly, even though I had them under environmental mesh from the moment I sowed. This year I'm going to try growing them between the parsnips, but not expect too much. I love carrots from my garden, but as you say, you don't get as much. Saying that, I find parsnips really good. One seed, but apart from watering when it's dry, I don't have to do anything and I always get a good crop. I agree, climbing beans are more productive than dwarf beans. My problem is that I cannot keep up permanent climbing frames (garden too small), and that the last 2 years I've ended up with more beans than I could keep up with, which I tended to stress over. My fave dwarf beans, in my raised beds, produce just the right amount. In many ways, I think Spoonie Veg will be quite individual, as everyones circumstances are different. I'm taking notes from people's comments so that I can capture these differences when I write up posts on individual veg & fruit. What a great idea! I don't grow fruit or veg, but I'll be reading along with interest! I think that this would make a lovely poster!! That seems like a really good way to think about it. Do you think how you grow things affects the spoon rating? For example, I've found carrots much easier since I've been growing them in containers and harvesting them as babies. I think that's a good point Matt. As Janet said, having permanent climbing frames for her beans makes climbing beans a better choice than French beans. And yes, possibly growing & harvest baby carrots might be a way around carrot fly. Will add this suggestion to my (eventual) post on carrots. I might try that this year. I'm also going to try growing my parsnips on the outside and the carrots inbetween them, to see if that makes any different to carrot fly. Picking up on what Matt said - I'm finding raised beds are much easier to cultivate on my clay soil. So spoon ratings may apply to techniques as well as particular veg. A really interesting post, I hope it makes gardening a lot easier for you. I still have my muscle problem and can only tackle the garden a bit at a time, doing what is most urgent each day. I was hoping it would be of use to people beyond those with chronic illnesses, so this is good to read. Perennial veg is definitely a low spoon option. Of course, you have to like the perennial veg in question. I've tried and tried, but I just prefer annual kale to perennial kale. So for now I've got sorrel and ramsons, and plan on putting in asparagus later in the year (the garlic is currently in the idea place so I have to wait). Thanks for that heads up about Mark Diacono's design, I'll take a look. He is doing such great stuff, I'm sure there is lots that we can learn from him. The spoon theory is a good one, I have dished it out to family members and even a couple of my doctors in the past. It can be applied to just about any long term condition. Thanks for sharing your experience with growing tumbling tomatoes Helene. I confess I've never tried them, and it does sound like it's a lower spoon option than the cordons. The biggest issue from an ME/chronic illness perspective, is that you could end up having a few bad weeks (I barely was able to garden last Aug-Sept) which means limited energy for feeding/watering. In this case for me, anything that needed attention didn't get it, so a lot of climbing beans went to seed, for example. That said, I would like to try out one tumbling tom plant (which I'll get from a garden centre) this year and see how that goes. Also, someone with mild ME or mild chronic illness (I have moderate ME) would be more easily be able to undertake weekly feeding, and frequent watering. I'll make sure I add your perspective into the post I will do on tomatoes (some point over the next couple of months). What an excellent approach. Something else that reduces spoons is an irrigation system. Hence the first year I had one (before I needed new hose and didn't do anything about it) I got fantastic Florence fennel because it was damp all the time. Following year was rubbish because I didn't use enough spoons on it. This is a great way to think about things for everyone and encourages you to really think about what effort is absolutely necessary for different plants. I'll look forward to future bulletins. Interesting point Helen, - I've never tried an irrigation system and it hadn't occurred to me to put one in when I designed my garden. It's not something I think I can personally put in retroactively (it would be a very big job), but it is something I could recommend for those that can afford it. And we know what to do if we get a leaky hose! That's also a really useful tip about the Florence Fennel - I didn't realise they preferred a damper soil. 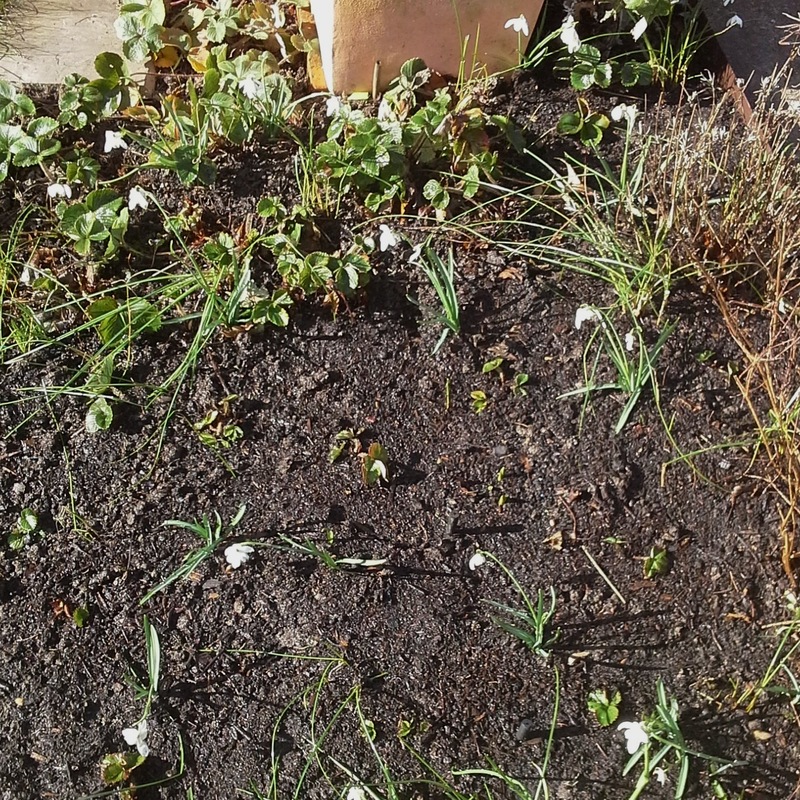 I'll try and water mine more often this year and see if I get bigger bulbs.